Welcome to Racerhead, where we’re counting down the days to RedBud just like everyone else in the world… Well, almost. The riders on the MXGP tour have one more weekend of racing, as the final round of the 2018 FIM Motocross World Championship take place this weekend at Imola in Italy. It’s the 20th round of their extended series, the longest ever. It will give Jeffrey Herlings another chance to add to his record totals for Grand Prix wins and moto wins, and it will give young Jorge Prado the chance to properly claim the MX2 title that’s already his—the last man with a chance, defending champ Pauls Jonass, is out with a knee injury. Add it all up and it shows that while riders based in the USA have the challenge of staying in shape through the month of September, the MXGP guys have the challenge of staying fresh and healthy as they keep racing right up until six days before the MXoN qualifiers next Saturday. And in the case of French teamster Romain Febvre and the aforementioned Jonass, their late-season injuries have knocked them out of the event (though Latvia was not going to come anyway). The late date of the race cuts both ways. Youthstream’s Giuseppe Luongo and Monster Energy’s Dave Gowland announced an extension to their partnership this afternoon in Italy, on the eve of the last MXGP of the season. All next week we will, of course, be talking about the event, the looming showdowns between Team France and Team USA, Eli Tomac and Herlings, Prado and Aaron Plessinger, and much, much more. That’s bench racing. Right now, let’s talk about all of the other cool things that are coming up surrounding the MXoN at Red Bud. 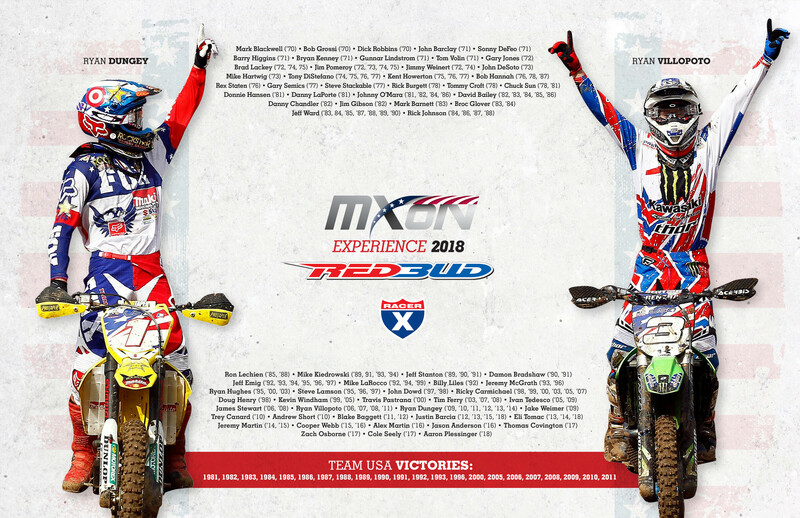 For starters, there’s the Team USA MXoN Experience that Jeff Stanton put together. On Friday night, the alumni of Team USA who make it out to the race will enjoy a banquet with 250 fans, all in support of Road 2 Recovery and the International Foundation for Research in Paraplegia. It will be one giant reunion of fast American men like Ricky Carmichael, Ryan Villopoto, Johnny O’Mara, Ryan Dungey, “Bad” Brad Lackey, Ricky Johnson, David Bailey, and just too many legends to mention here. It should be an epic night of bench racing and a rare chance to rub shoulders with so many motocross legends. The good news for R2R is the fact that the dinner is completely sold out, which seems like bad news for everyone who did not get a ticket. 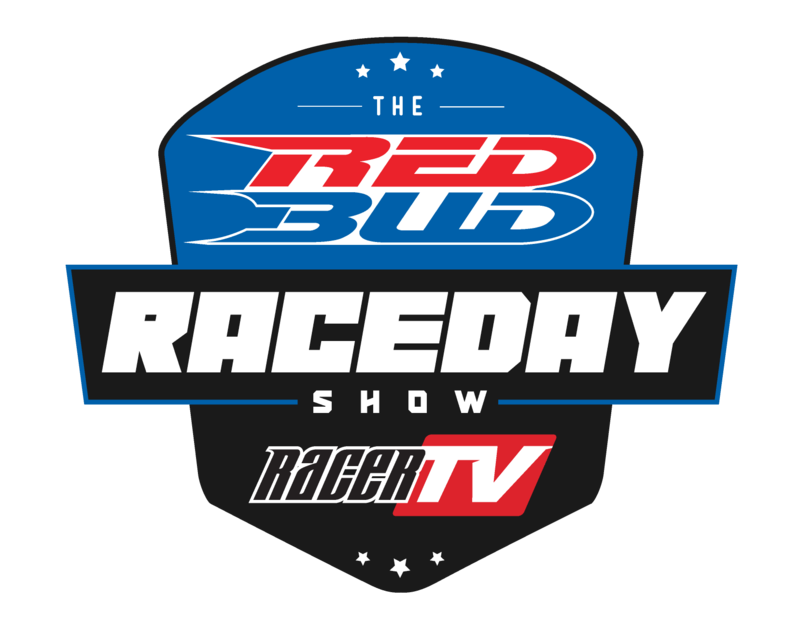 The good news is the dinner will be covered on the RedBud Race Day Show, which will stream live next Friday night and Saturday night on www.racertv.com. We are bringing in a stage and the same TV talent that brings you GNCC Racing every weekend, as well as the Loretta Lynn’s coverage, every day of that week. 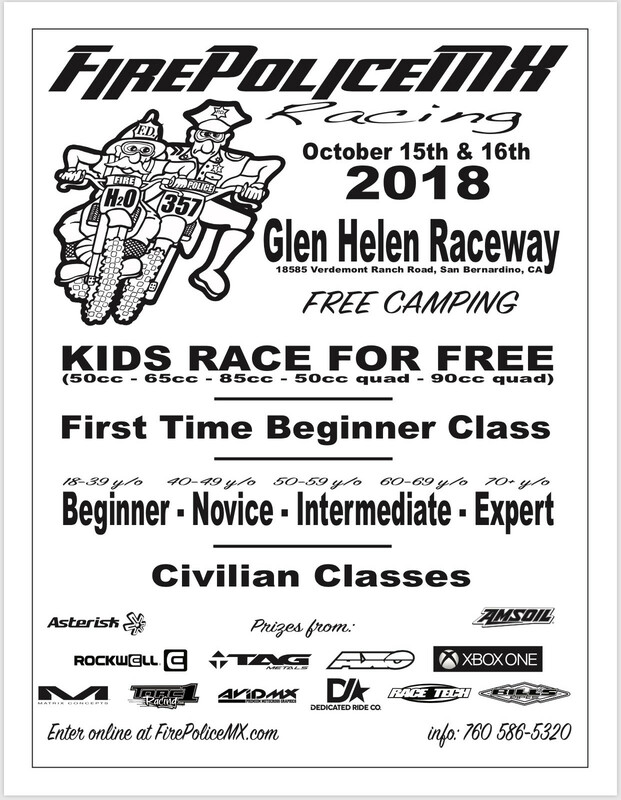 RedBud Race Day will be hosted by Jason Weigandt, Rob Buydos, Steve Matthes, MegaWatt, and myself, and the plan is to spend Friday and Saturday previewing the MXoN, breaking down the qualifiers and all of the events of the weekend, interviewing as many moto celebrities as we can, and just trying to share the Motocross of Nations experience with all of the people that can’t make it to RedBud, which promises to be one of the biggest motocross races ever! Racer X will be handing out these cool autograph sheets for Jeff Stanton’s MXoN Experience, as well as at our booth, while supplies last. We will also be covering the THOR Pit Bike of Nations, which will take place Saturday night and promises to be a lot of fun, with a lot of very fast guys (and Sweet, Sweet Lou Lopez) on pit bikes. How fast? Team USA is Willy Browning, Ivan Tedesco, and Ryan Villopoto! Finally, be on the lookout for an epic Racer X Podcast that Jason Weigandt and I did about the long, strange history of Team USA at the Motocross of Nations. It’s just a long conversation/history class on America’s fortune in the Olympics of Motocross, and it might be a fun listen for you while you’re on the way to RedBud. Here is Part I, check out Part II next week. It’s going to be quite a weekend in Michigan for motocross, and we’ll let you know more of what else is going on as we find out ourselves. We are headed out on Monday to get up there to pitch in and help out as best we can! It's too familiar of a story for Dean Wilson—a two-year deal with a prominent 450 factory team has come to an end after injuries robbed him of his potential. Wilson announced today that his contract will not be renewed by Rockstar Husqvarna for 2019. There were hopes the squad might be able to find room for Dean even with Zach Osborne graduating to the 450 ranks next year (alongside Monster Energy Supercross Champion Jason Anderson), but it was not to be. "I thought there was going to be a chance I was going to stay but unfortunately the 3 man 450 team got shut down," said Wilson in an Instagram post today. Wilson, the 2011 AMA 250 National Motocross Champion, had a deal with Red Bull KTM in the 450 class for 2015 and 2016, but both of those seasons were cut short through a pair of torn ACLs. He entered the 2017 season as a full privateer riding a Yamaha with his dad as his mechanic. A few races into the '17 campaign, though, Rockstar Husqvarna called with a replacement ride after Christophe Pourcel decided not to race supercross any longer, citing difficulties with a neck injury. Wilson's main goal for '17 was to make it through the season healthy, which he did. He hurt his shoulder on opening night at Anaheim 1 in 2018, though, and then suffered another torn ACL when a rider cut him off while testing for Lucas Oil Pro Motocross at Glen Helen. As much of a hard pill to swallow it is I want to thank @rockstarhusky for such an awesome 2 years. I thought there was going to be a chance I was going to stay but unfortunately the 3 man 450 team got shut down. I’m really gonna miss this team they really made me feel like home. Thank you Bobby , Scuba, Murph, Mohead and all the mechanics. My team mates were awesome and there is nothing I could say bad about this team. Thank you for everything. I think I may have to call Dad to get the old sprinter running again. Who knows what’s next? The Spanish teenager Jorge Prado has built a special connection with Italy. It was in that country where the 17-year-old Prado got his maiden Grand Prix win in the FIM Motocross World Championship in 2017, when he won the MX2 class at the GP of Trentino. Italy is also the country where Prado has taken the most GP wins so far; Prado has collected 14 GP wins, and three of them were on Italian soil. And since the beginning of this season, Prado has lived in Italy, as he is racing for the Italian De Carli team inside the Factory KTM team, and that fact means that he has the Italian legend, nine-time world champion Antonio Cairoli, as his training partner and mentor. The Italian connection will deepen for Prado this weekend, as this Sunday in the last round of the '18 MXGP tour, and he can celebrate his maiden world championship title right in Italy. Prado will be the second Spanish world champion ever, though the previous one came in the lower-tier MX3 racing from Carlos Campano. Prado will also be the second-youngest world champion ever in the history of the championship behind the German superstar Ken Roczen. 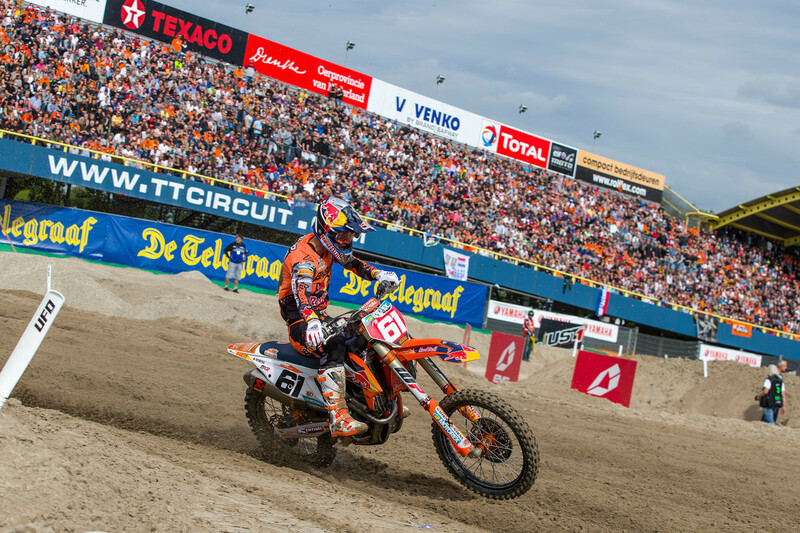 Going into the Italian GP this weekend at Imola, Prado has a 46-point advantage ahead of his main rival, the reigning MX2 world champ Pauls Jonass. But earlier this week, it was announced that Jonass underwent surgery for a damaged knee and will not race this weekend. That means Jorge Prado is already the 2018 MX2 World Champion, and he will put on the crown for the first time in Italy. Let's skip ahead past the Motocross of Nations at RedBud and even the Monster Energy Cup in Las Vegas to that other off-season get-together, Red Bull Straight Rhythm, which will be held October 20 at the Fairplex in Pomona, California. If there was ever a medal given for clever, fun marketing, the people behind this year's event would get it. From the taunting, back-and-forth tweets of two-stroke riders like Ryan Villopoto and Ryan Sipes to the "Al Bundy" video of Ryan Dungey getting called out on his couch (and, of course, Ronnie Mac), they've been having too much fun. But when we got a Fed-Ex package this week with a full-blown issue of Cycle News, #redbullstraightrhythm went to the front of the pack. They built a full-blown issue of the once-weekly printed newspaper with defending Two-Stroke champ Gared "Stank Dog" Steinke on the front. 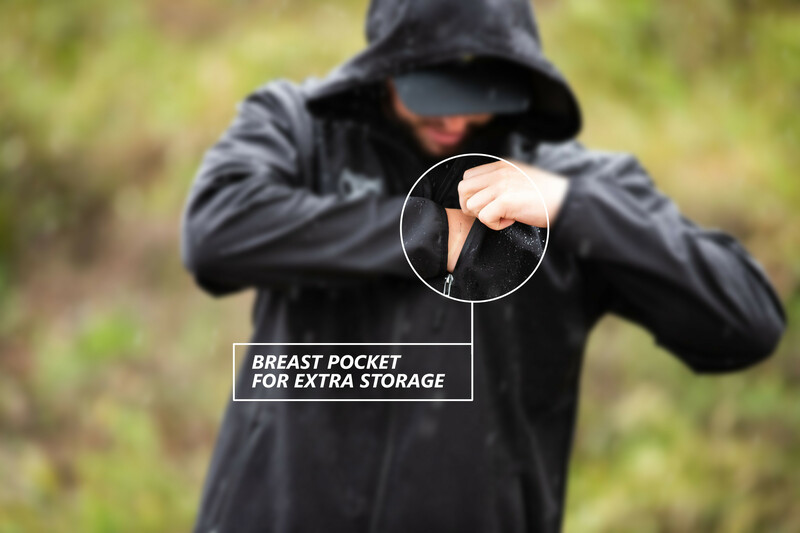 The paper was conceived by Red Bull's Jeremy Mallott and Dave Szych and published by CycleNews.com's Sean Finley and Kit Palmer, with contributions from true Cycle News alumni like Donn Maeda and Jean Turner and contributor Steve Matthes. The 64-page paper is a not only something of a program for the event, but also a fun trip down memory lane right to the nineties, which is the theme of the whole two-stroke event at Red Bull Straight Rhythm. 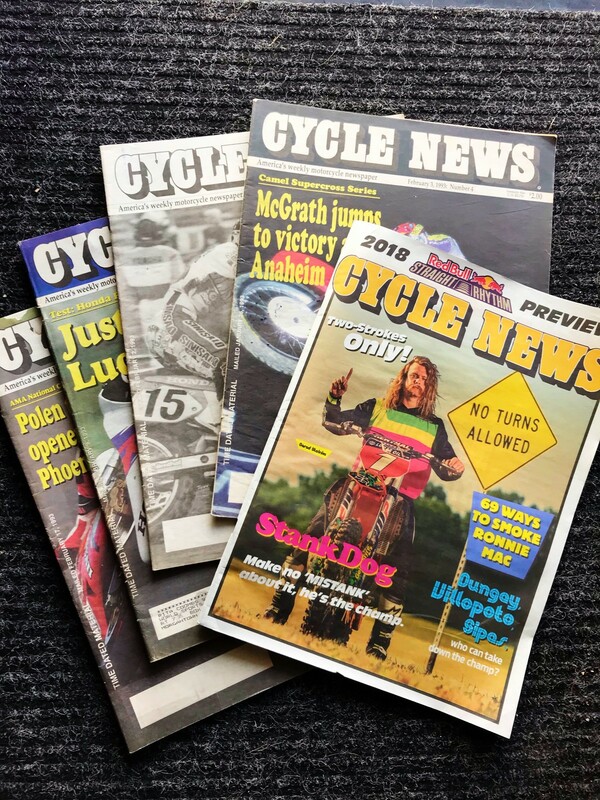 Keep your eyes out for this newspaper; it's definitely a keeper if you're into moto memorabilia like we are—and you'll just love getting all of that ink on your fingers, just like it's 1993 or so! 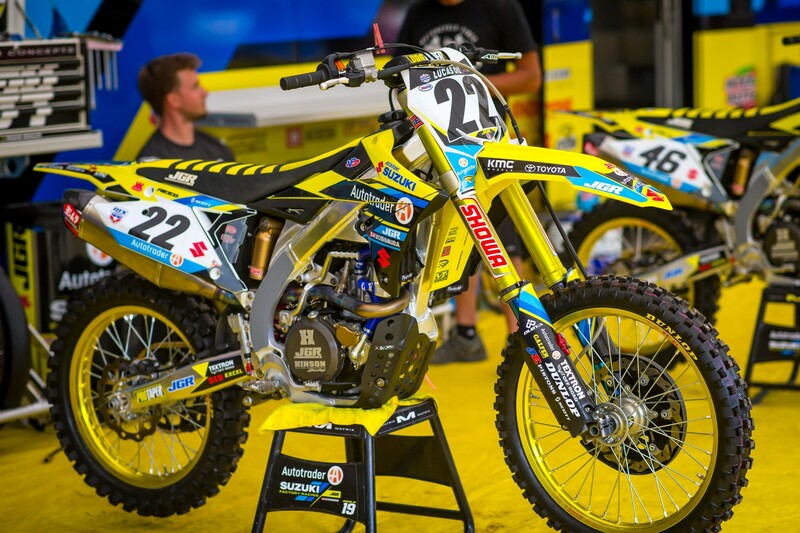 When I was in Montreal a couple of weeks ago, it seemed like the guys there for Alex Martin's debut ride on the Autotrader/Yoshimura Suzuki team thought that the Reed-to-race-supercross-for-JGR thing would get done. No specifics, but just a confidence that the three sides (Suzuki, JGR, and Reed) would find a way to get a deal done. And it sounds like Chad's all in on the process. By the way, all the Chad Reed haters were probably, well, hating even more when Feld Motor Sports put out a PR about the band Pennywise playing the Monster Energy Cup pit party and specifically mentioned Reed in the headline racing the event. Not current champion Jason Anderson, not Monster Energy rider Eli Tomac (both of those riders and more were mentioned later on in the text), but it was Chad Reed. As in: “Two-time World Supercross Champion and international superstar Chad Reed leads cast of all-star invitation-only event." I just thought it was interesting, that's all. I hope it works out for everyone to get #22 on the Suzuki for SX 2019. 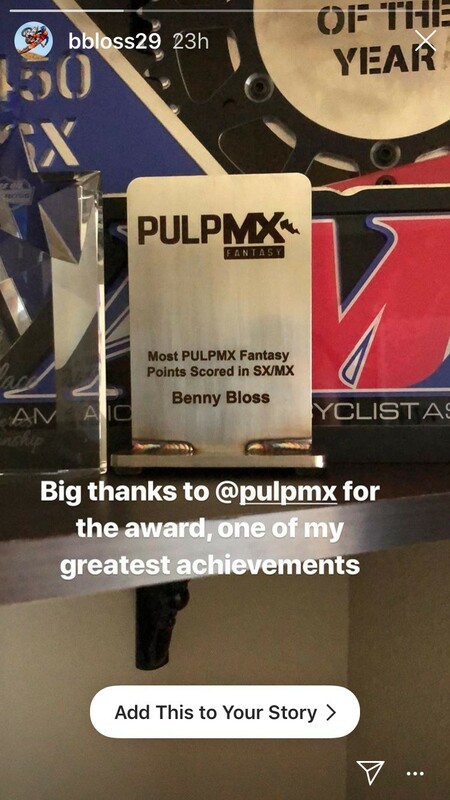 What a week for Benny Bloss of the Rocky Mountain ATV/MC-KTM-WPS team, as first he's honored with a Pulpy for scoring the most points all year in PulpMX Fantasy, then is awarded #29 for 2019. Of course, Bloss was a teammate with Andrew Short, who held #29 for a long time, and because that's all related, PulpMX.com's Cory Moser had to "interview" both Bloss and Short about the responsibility of holding #29 here. As you've probably noticed over the years, I love collecting motocross- and dirt bike-related memorabilia. I have pretty much every magazine since the late sixties, and I would put my sticker collection up against just about anyone (sorry, Throttle Jockey). 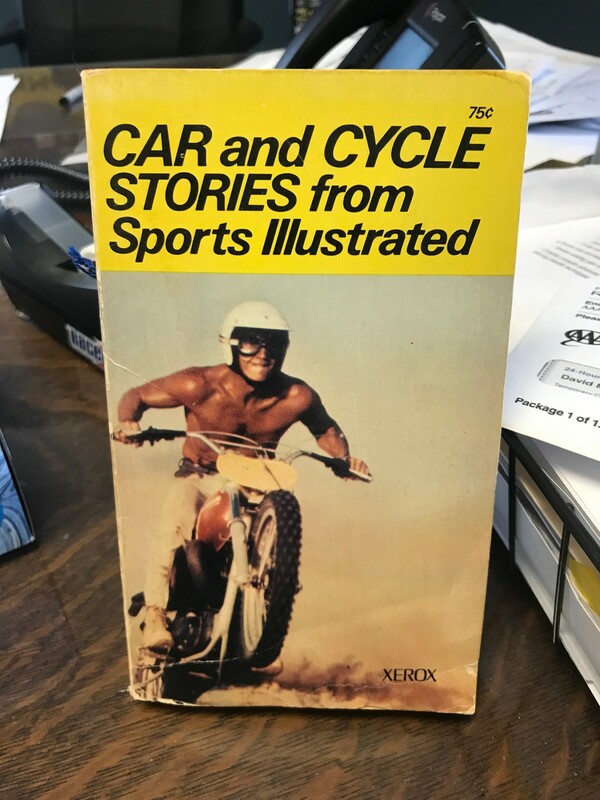 I also collect books and mainstream magazines that have cool motocross articles, and I recently came across a Sports Illustrated-published paperback book that included a collection of stories about auto and motorcycle racing from the weekly magazine. The motocross story included was about the 1971 Inter-Am Series at Saddleback Park, which was called "Riders on the Brink." 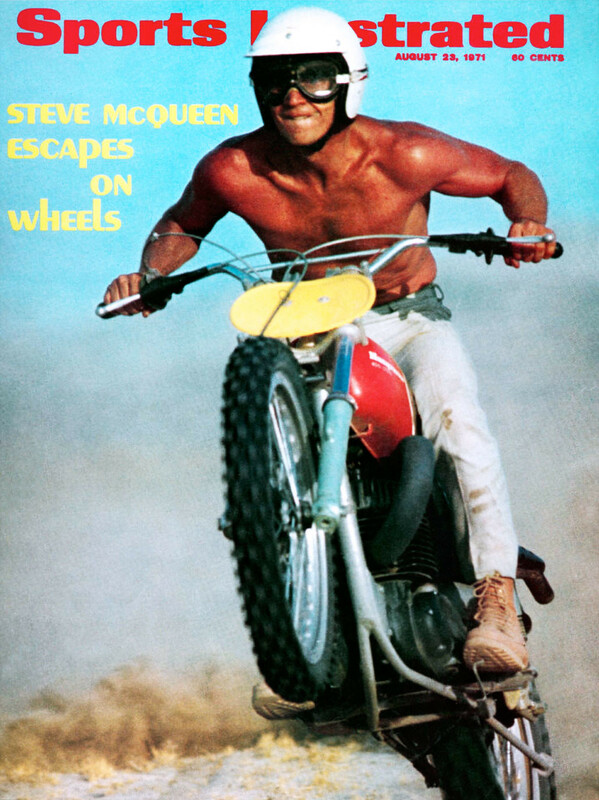 However, the photo on the front of the book was not from the Inter-Am, but was rather a legendary shot of Steve McQueen riding a Husqvarna, shirtless, in the California desert. The photo first appeared on the cover of Sports Illustrated in 1971, a time when McQueen was one of the biggest stars in Hollywood. He was a well-known motocross and off-road enthusiast, even starring in his friend Bruce Brown's epic motorcycling documentary On Any Sunday. Here's the funny thing: The shot of McQueen that also appeared on the cover of the magazine and also on the book had one flaw: The book designers ran the photo backwards. "Venice considers alcohol ban to combat tourism" —The Telegraph U.K.
Maybe remind AP23 of this little snippet from Racer X Illustrated (from earlier this year). Love to see it since he is now selected to represent the USA in the Motocross des Nations at Red Bud! Ride on!!! Hey, George, we reminded him! Hey @aaronplessinger_7, you getting that mohawk ready? ? What’s scarier than a haunted house in October? 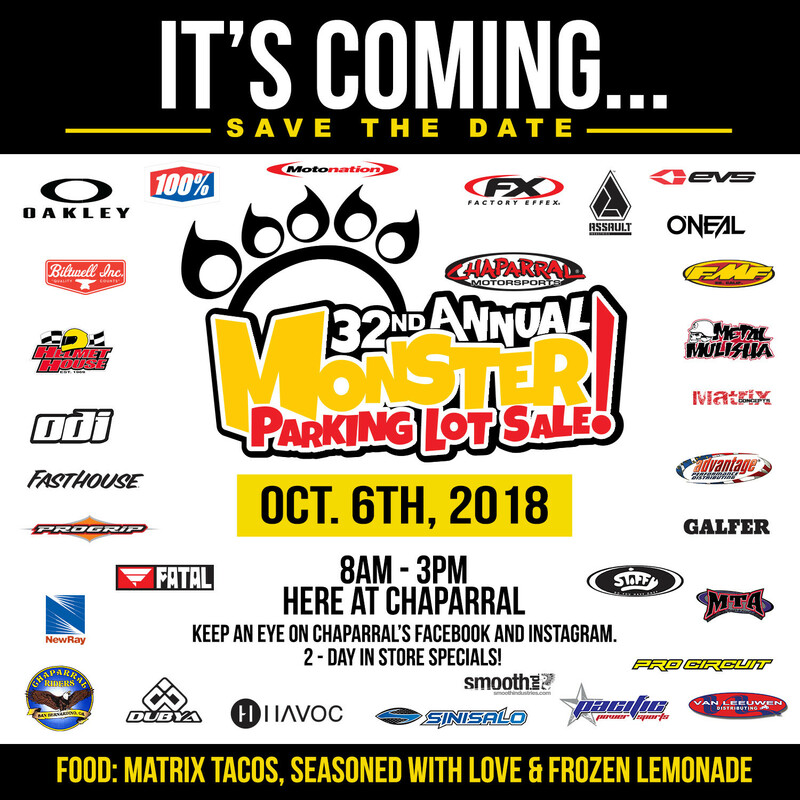 Missing Chaparral Motorsports’ Annual Monster Parking Lot Sale. On Saturday, October 6, as they’ve done for 31 years straight, Chaparral Motorsports will have its largest sale of the year. Commonly referred to as the MPLS for short (or just PLS if you want to make it really brief), this is the one time of year where you can find insane deals on a huge inventory of motorcycle, ATV, and UTV tires, as well as gear and accessories. To put it in perspective for those who have never been to the Chaparral Motorsports Monster Parking Lot Sale, the event is so big and there are so many vendors that it can’t fit inside Chaparral’s massive 160,000 square-foot store and must be held in the parking lot behind the store. 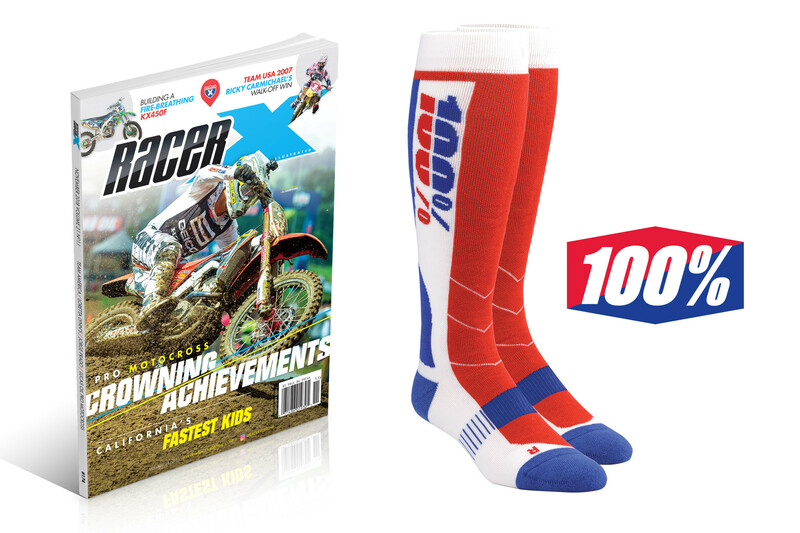 Subscribe now for as low as $9.98 and receive a FREE set of 100% Moto Socks, plus immediate access to our current digital edition. 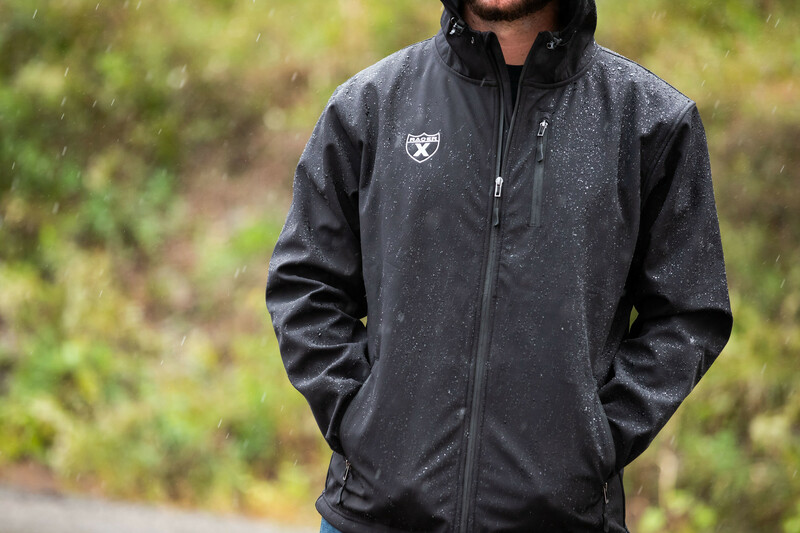 All-Weather Soft Shell Jackets available for Pre-Order! 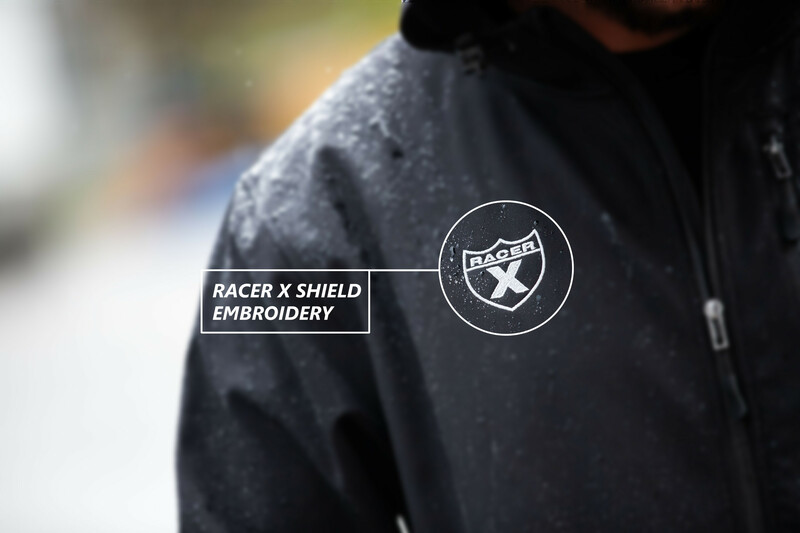 Racer X Brand is releasing All-Weather Soft Shell Jackets. 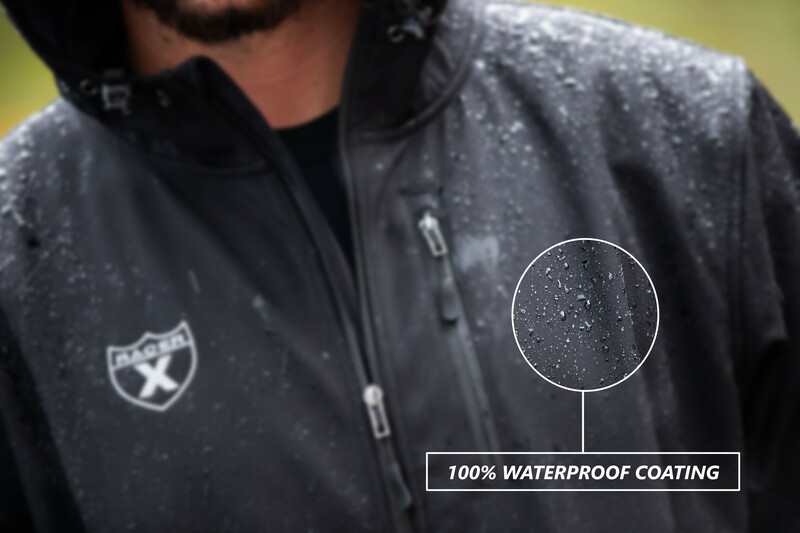 Pre-Order yours now at a discounted rate to ensure you get yours before they sell out. Pre-Order option is only available until October 2. Upon purchase, please allow 4-6 weeks for shipment arrival. You will be notified once your order has been shipped. 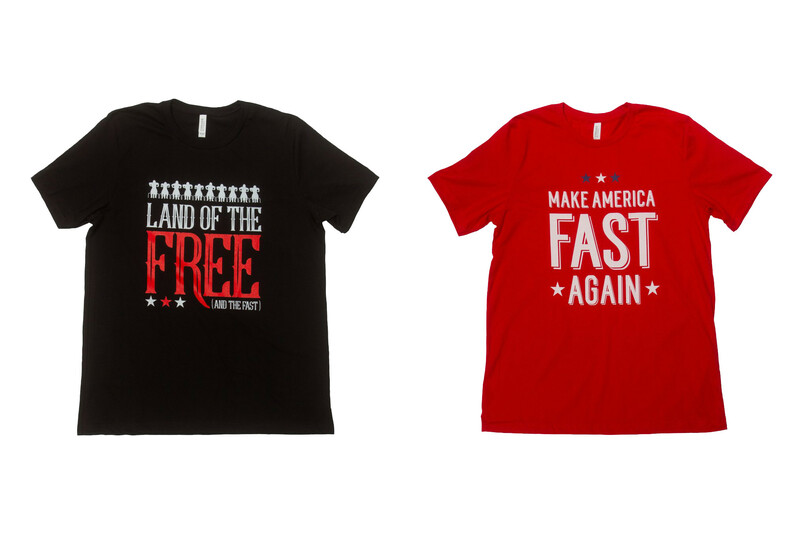 If you are thinking to yourself "Man, I really to want buy one of those awesome Racer X Brand Patriotic Collection tees to wear at RedBud for MXoN next weekend, but i'm worried I won't receive it before I leave for the race." Fear not! They will be available to purchase at the event in the Racer X Booth, which will be set up on vendor row. Make sure you stop by and get yours before they sell out. That’s it for this week. Thanks for reading Racerhead—we’ll see you at the races.